Around 20,000 inhabitants of a number of villages under Mirik block may soon get cut-off from the rest of the world as the diversion constructed over Guye Khola in Lohagarh is on the verge of collapsing. A concrete bridge over the river was washed away in 2013 and since then, the concerned department has just been constructing diversions instead of finding out a permanent solution. The present diversion is in a perilous position and can be washed away any moment if heavy rainfall persists. The first diversion constructed in 2013 at a cost of Rs3 lakh did not last for more than three months. The existing diversion was built last year at Rs6 lakh and it is also on the verge of getting washed away. Once this happens, nearly 3,000 students will not be able to commute to their schools and colleges. More ominously, if vehicles cannot cross the diversion, the Lohagarh tea garden would be forced to shut down as supplies of essential goods including coal and fuel would get cut off. Residents of Potong, Khaprail, Khairbani, Hiley Jhora, Lohagar and even people from eastern Nepal use this bridge to get to Naxalbari and Siliguri. 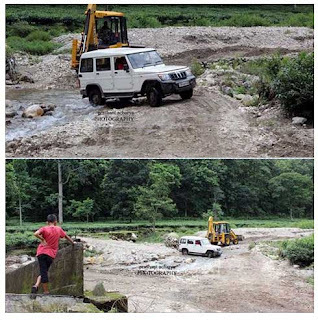 The alternative route to Siliguri, via Chenga and Panighatta, is also blocked after the Manjha River changed its course and damaged the road. "The bridge over Guye Khola at No. 20 section of the tea garden collapsed in 2013 due to heavy rainfall, but the concerned authorities including political leaders are least concerned in resolving this major problem of the locals. Instead of putting in money in diversions, they could have constructed a permanent bridge," said a local resident who denied giving his name. Rajendra Sharma, senior manager of Lohagarh tea estate, said, "The diversion gets washed away even when the rainfall is just 2-3 inches, and the garden management has to erect temporary passage ways every time using the garden’s resources. If vehicles are not able to come to the garden, there can be no transportation of necessary items such as fuel as also the dispatch of finished goods and procuring of green leaves from other gardens."